Happy Monday Lia! The Char Siu looks delicious! We Char Siu for lunch too..
@Shaz : Thanks a lot Shaz for your kind comment! Happy mood on happy monday! Hey you should make a Zorua bento. That is a super cute pokemon. @ChantaleP : Thanks a lot Chantale! Your sweet comment put a smile on my face, always :) Happy Monday! Hope you enjoy your week! happy monday to you too lia! I have seen the tip, thanks Lia! I will surely try it out and hopefully this weekend :). The two bugs are just adorable, I love how you use food picks as the antenna! Hum a couple of heart bug in monday morning. Really sweet and tasty for imagine. By the way mba lia, do have a facebook account or YM ID? 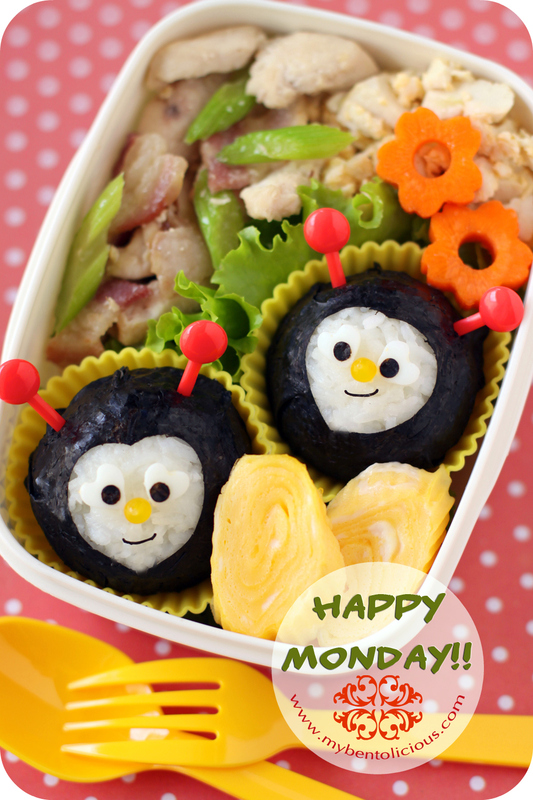 This is adorable - I want this for my lunch! How did you make the carrot flowers by the way? Do you have a cutter for it? I love your bento boxes, so lovely to just look at, I wouldn't want to eat them! I tried to make a bento box today (my first one ever!) and hopefully one day I'll be as skilled as some of the other bento box makers I've seen out there, such as you. Great blog!